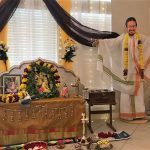 The weekend of September 18-19 saw a bevy of satsangs in Namadwaar and the residences of devotees in the Pearland area of Houston. 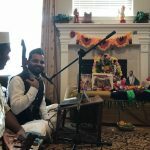 A 12-hour Akhanda Mahamantra sankirtan was held on Saturday, Sep 18 from 6 AM to 6 PM at the Houston Namadwaar. This was one of the monthly Akhanda Nama kirtan sessions, which have now become a regular feature at the Namadwaar. This time round the occasion was doubly special as the Namadwaar was graced by the beautiful, benign presence of Sri Swamiji’s Holy Padukas from Boston. 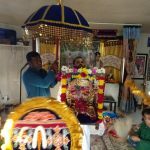 Sri Narayanan from Boston, MA, Sri Ramaswamy from Chico, CA and Sri Aravind and Smt. Geetha Aravind from Orlando, FL were among the out-of-town visitors who attended the Akhanda Nama. The day was filled with rhythmic chanting that was at times enthusiastic and exuberant, and at other times quietly peaceful and meditative. 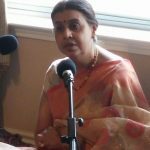 After the conclusion of the Akhanda Nama, Sri Narayananji gave a wonderful talk. He started off speaking about Narayaneeyam and the way the Lord is described (from head to feet and feet to head) by Sri Narayana Bhattathiri and various other bhaktas/saints, and then he moved into a discourse on Ambarisha charitram as it was the auspicious Ekadasi day. 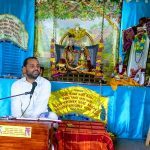 He spoke of the glory of King Ambarisha and his utter humility and devotion to the Lord. The satsang concluded with Kaliyaiyum bali kollum and Arati.